Most professional facials take at least half an hour, so you can use the time to sleep, think or talk to your facialist about your skin particulars or life in general. 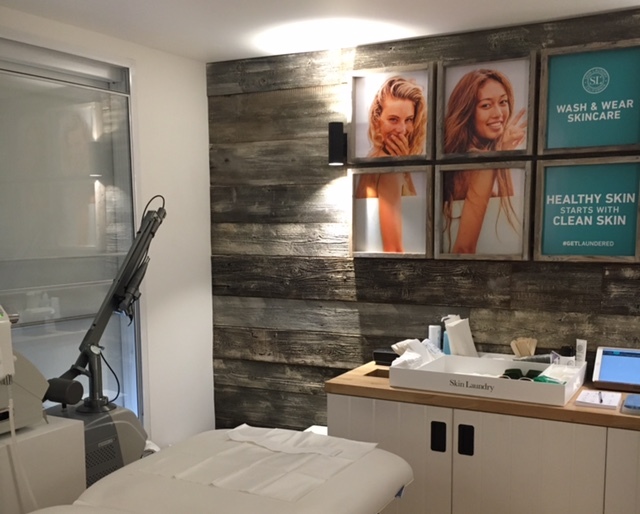 Yesterday was an interesting ‘first’ experience for me of a 15-minute Skin Laundry Facial. This US skincare brand that has been on my ‘beauty radar’ for a while, thanks to my NY and LA girlfriends and this month it ‘landed’ at Liberty of London beauty counter on the ground floor. Last week I had a pleasure of talking to Yen Reis, Skin Laundry founder, who was in town to introduce her skincare brand to the UK in person. We talked about Yen’s own skin issues that resulted in her launching Skin Laundry and the way she combines Asian skin beauty ritual ( which for some women can entail about ten steps and takes time and daily effort, as Asian women, unlike their European counterparts, have more patience and take time and care looking after they skin properly and not jumping from one potion promising magic to another) with the results-driven modern science. – do use a scrub on your face in the evening of the day you have your treatment. The facial itself is a two-step YAG laser & IPL (intense pulse light) treatment, that is suitable for most skin types. Before you book yourself in, it is worth-while to check out the Skin Laundry website and going through the list of contraindications ( please click here ). The list itself is quite long, but it is reassuring that the brand is thorough with its vetting process – which in many ways is more US than European, as in protect and be protected against litigation. Once you go through the list and sign yourself in at the Skin Laundry counter at Liberty (the screen is immersed in the wooden frame and looks pretty cool), one of Skin Laundry trained professionals ( mine was lovely Miriam ), will take you up to the treatment room on the first floor of Liberty London, which is a cool oasis of calm serenity. Beware though, as the shoe department is right next to the treatment room and will draw you in like a magnet post treatment ( you clever sales people working in-store, giving women two of the things they love at the same time)! Before the treatment starts, you are given a Skin Laundry facial wipe to take your make-up off ( that was the only point step that I didn’t like, as I prefer to have my face properly cleansed with a product, rather than a face wipe ), then you are ready to climb on the firm, but comfortable treatment bed. Miriam made sure my hair was off my face and then put special glasses over my eyes, to protect them from the bright light, and we were ready to go. Miriam asked me if I had laser before ( which I confirmed I did ) and tested it on my hand, which felt a bit tingly. Once I confirmed I was comfortable, Miriam proceeded with treating my face with a laser twice – while it’s not uncomfortable, you do feel like electricity static on your face and it smells a bit like the dentist drilling your tooth. Having said that, don’t be put off by the description – I actually felt quite relaxed, even before Miriam said that this smell was ok and my skin was looking good. After two rounds of laser, which evaporates dirt, make-up and bacteria from your pores, a soothing gel is applied liberally all over your skin and your face gets treated with red light, which flashes you will see even with your eyes closed. IPL delivers high intensity pulses of broadband light that helps reduce redness, if you are prone to it, as well as evens out the skin tone. Once this was done, Miriam cleared the gel from my skin & applied Skin Laundry ‘Advanced Protection Daily Moisturiser with broad spectrum SPF35‘ (which I have been using for a week and which texture works well for my skin right now – it feels rich, but sinks in quickly and leaves no residue, even during hot days that we are currently experiencing). After 15 very relaxing minutes I was out of the door, make-up free, to continue my day ( the spot I have on my upper cheek was there before the facial ). I went out confidently into the city and when I looked at my face a couple of hours later, my skin did looked smoother, plumper and fresher. The only thing that I did before an evening meeting was apply Sarah Chapman’s Skin Veil with SPF 35 to add a little bit of colour to my skin and top up my SPF, some blusher and lip balm and I was ready to wrap up my day beautifully. This treatment normally costs £50 ( the brand also offers treatment packages ) and while I wouldn’t recommend booking a course of treatment without trying it yourself first, having had just one so far, I am certainly inclined to try it again and compare results – consistency is the key and I don’t believe in miracles. Did the facial deliver on its ‘cleaner, clearer, brighter and tighter complexion’? It certainly did in my case and I value honesty when it comes to my skincare and face treatments. Another benefit that for now Skin Laundry team offers the first treatment for free to new customers, so do make a booking at skin laundry.com/uk and see what effect it does have on your skin post summer.